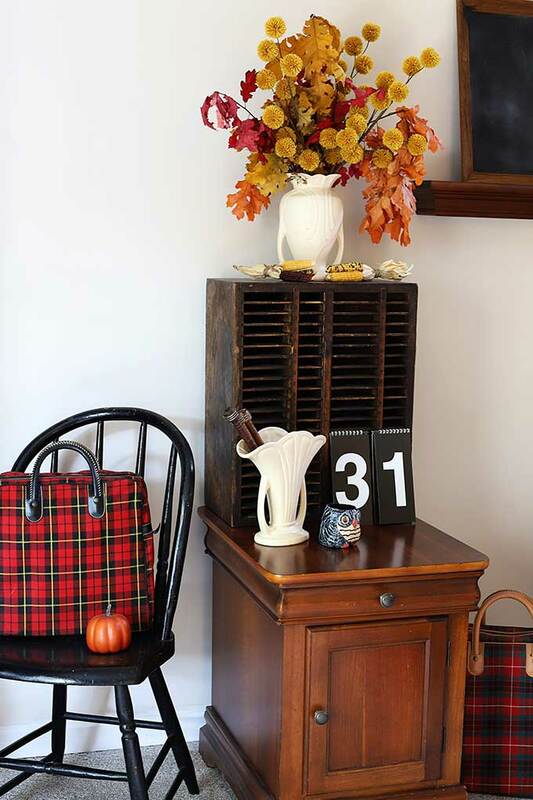 I titled this “Late” Fall Home Decor because, well . . . I’m late. In the world of blogging at least. 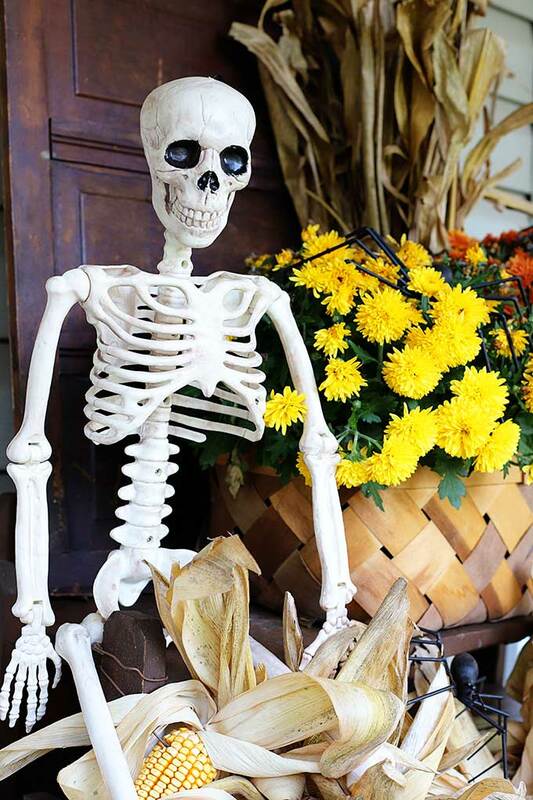 But life happens and one day you’re in your bikini toasting weenies and s’mores by the campfire and next thing you know it’s the end of October and you have yet to share very much fall decor besides some porch stuff. So better late than never, right? Well, I decided to do a very light Halloween theme in the house this year. Basically just my fall decor with a few key Halloween pieces thrown in. Some years I go all out. Some years it’s more subtle. You can’t get more subtle than a casually tossed in number 31. Well, until you move over a few feet from this vignette. Then subtle makes way for my son’s new friend. I told him not to drink out of my thermos, who knows what kind of germs he has. Besides, coffee goes right through him! In my kitchen dining area I have a soft fall vignette consisting of mostly thrift store finds, except for the flowers which I bought at the grocery store. 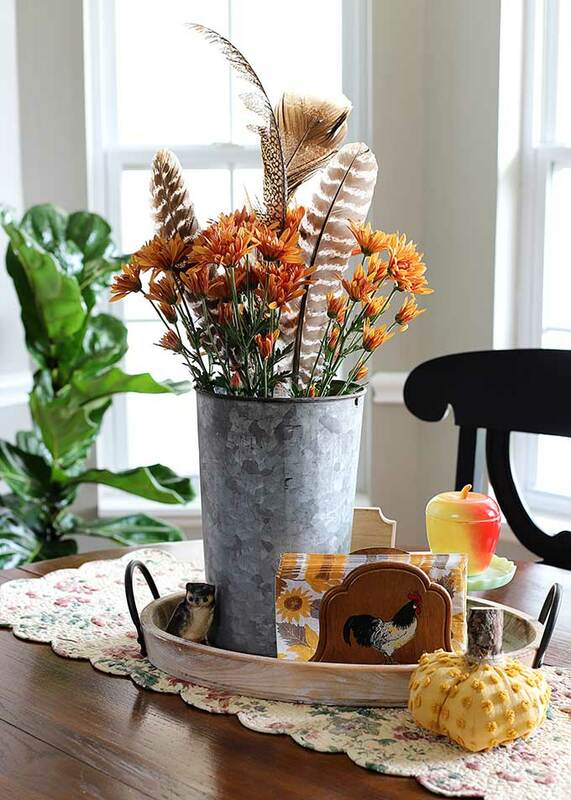 I always find those inexpensive “bouquets” of flowers at the grocery to look a bit scrawny when you get them home, so I added some feathers to fill it in and fall-ify it up a bit. That wooden napkin holder is one of my favorite finds this year. I think it was a yard sale find, but who knows now. Maybe I should write down where I find things and how much I paid? Does anyone do that? 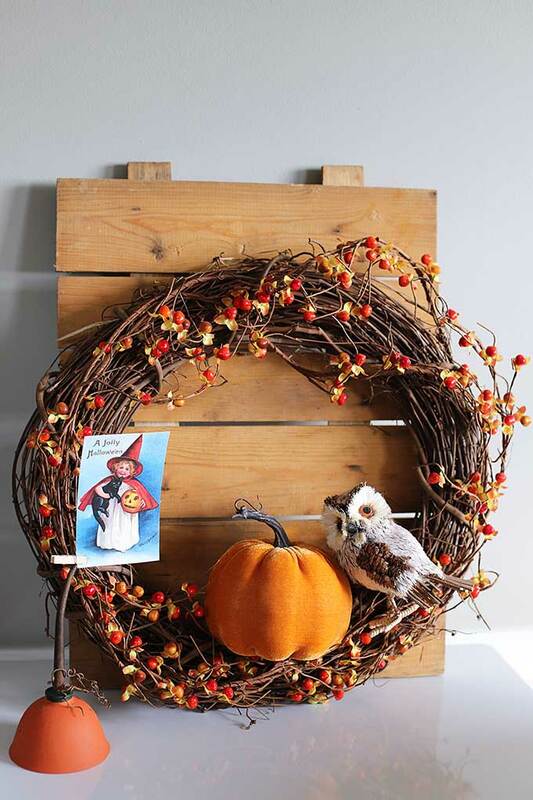 On my vintage baker’s cabinet I have last year’s fall wreath just setting up against a piece of wood I found in the basement. I think it may be the top from a wine crate??? The oil can pumpkin is the one I showed you earlier this fall. When I had my act together. 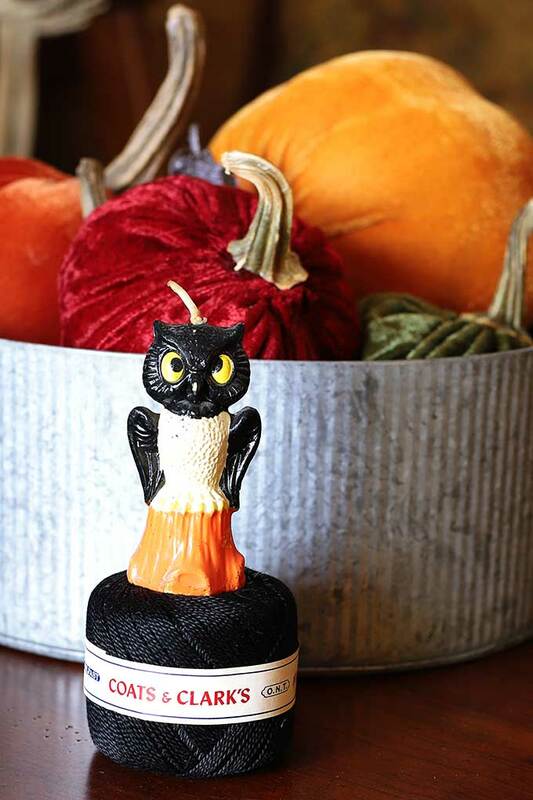 This little owl guy is a vintage Gurley candle I bought at an antique store. Don’t get all excited, it was one of those super cheap antique stores and he was only $5. I avoid the high end fu fu antique stores at all costs. 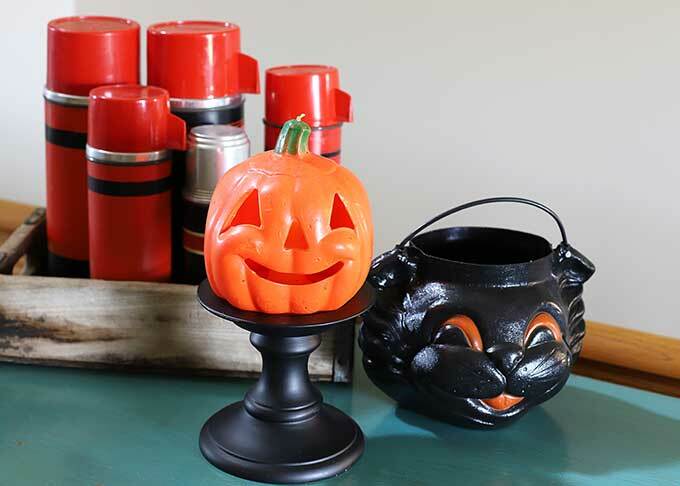 And this is the Gurley pumpkin candle I showed in my I Lost My Head At The Country Living Fair post. I don’t know if the cat pail is vintage or not, but he does have that look about him. The other day in Instagram Stories I showed you how I was drying my Limelight hydrangeas. I waited until the end of October so I could capture some of the vibrant pink and burgundy colors of the fall blooms, as opposed to the very light green color of the late summer blooms. They look perfect in this old thermos jug. The video of the hydrangea drying process is saved to my Story Highlights on Instagram (it’s the 2nd one over right now) if you want to pop over there and check it out. Instagram Stories is where I share some behind the scenes scenes. Of scenes. 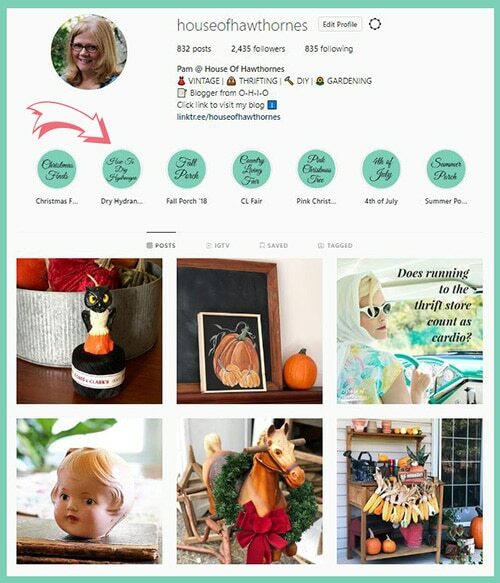 You might also like my Christmas Finds (the 1st one) where I show you some vintage inspired Christmas stuff I find while out shopping at the stores (the wreath I fell in love with at Michael’s is worth the look-see). 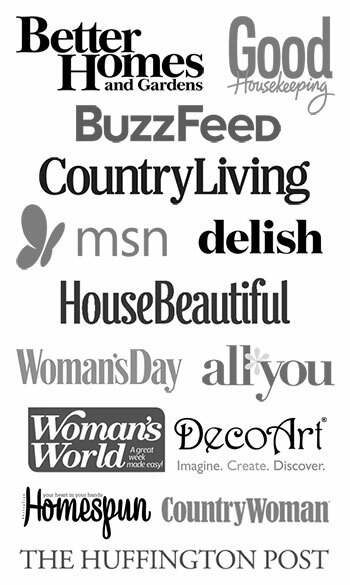 I’m planning on adding to it throughout the holiday season whenever I run across something you might want to check out. 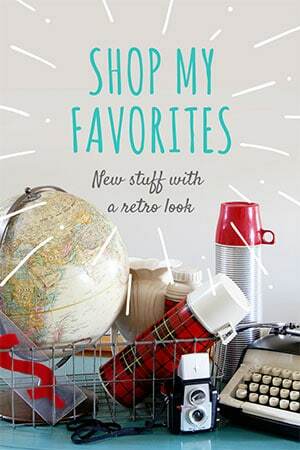 There’s so much good stuff at the stores this year! 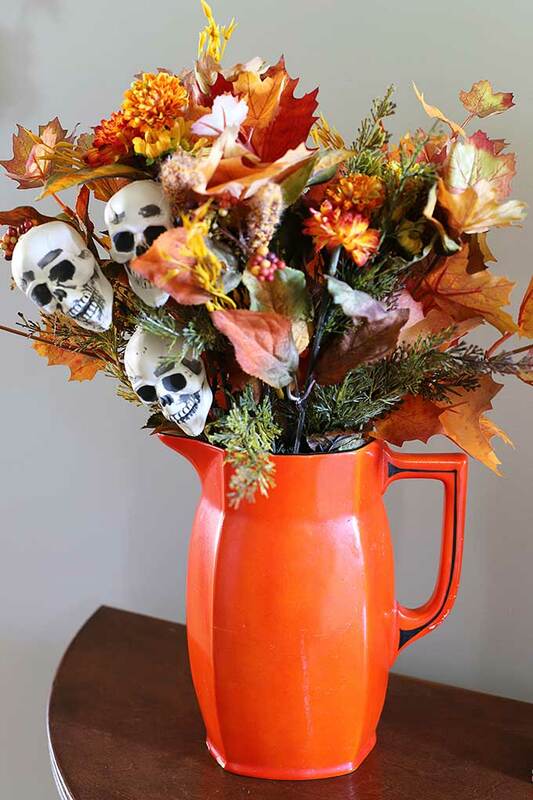 OK, I have to tell you I had the HARDEST time fitting this Art Deco orange and black pitcher into my Halloween decor! I bought it a few months ago at a local thrift store. I LOVED it and immediately knew I just had to have it for Halloween. Like big heart eyes, running to the check-out hoping I don’t trip kind of love! It’s a Czech piece, which according to Google tends to be in bright colors (hello, ORANGE). But after I got it home my love affair waned a bit. I couldn’t figure out how to fit it in with my more subtle fall decor, so it just sat there for weeks. I had black roses in it for a while and that just WAS NOT me, so I switched it out to fall foliage with a scary skeleton pick in it! 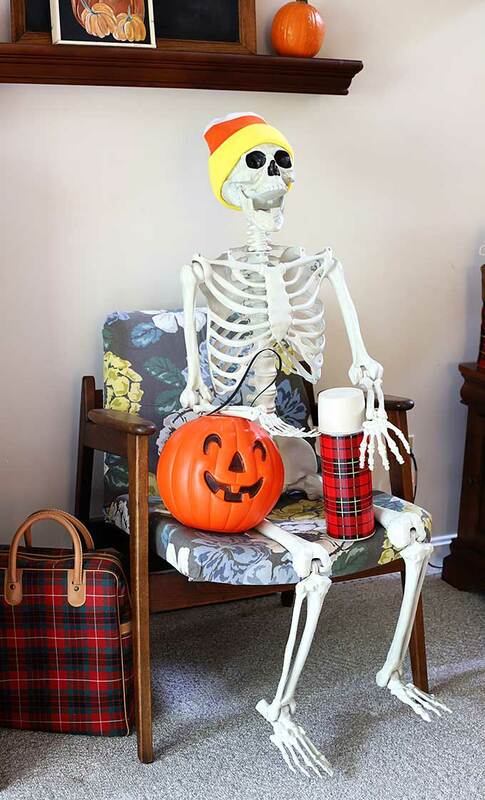 OK, I’m not sure the skelton pick is “me” either, but I do have somewhat of a skeleton thing going this year. I even propped one up on the shelf on my fall porch to ghoul it up a bit! He looks a little hungry, doesn’t he. Maybe a Snickers bar would help! This is a smaller version of the one sitting in the living room. It makes me a little uncomfortable that he’s child sized though, so I banished him to the outside. That’s what you do with bad kids, don’t you? So tell me, did you decorate for Halloween? Like 3 months ago, or just recently? 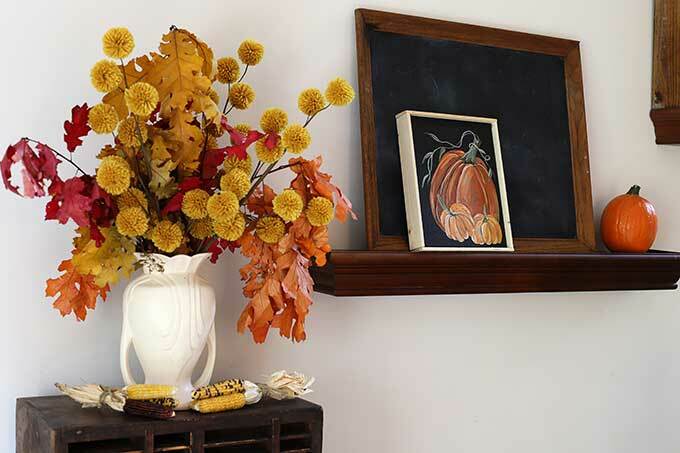 I love all of your fall decor, Pam…especially that beautiful arrangement in the white vase! We have a skeleton thing going on here, too. We tend to get our spooky on, and it is GONE the day after Halloween! Miss Pam, Is the ivory vase by the numbers 3 and 1, (31, ha) a McCoy? It is beautiful! As always, love how you pull your pieces together, especially all your naked bone friends! Very nice! 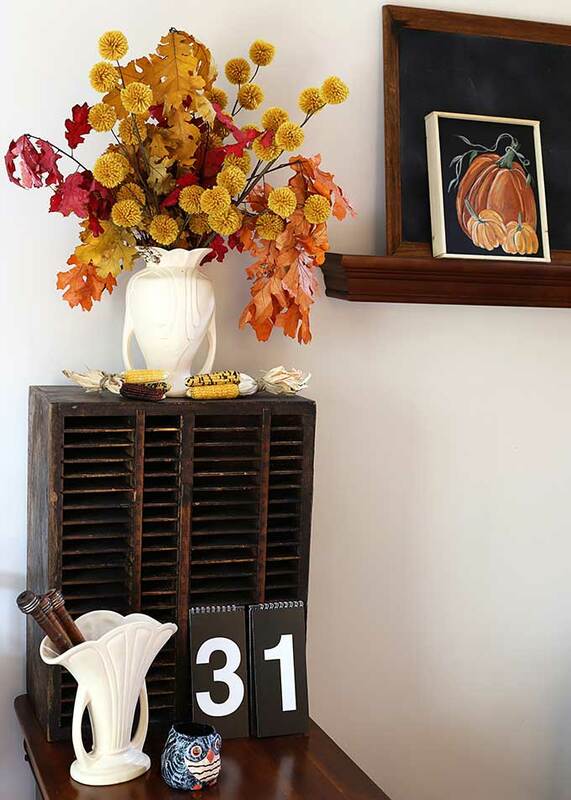 I think I like “fall” better than “Hallowe’en”, and I definitely like vintage over Michaels, but it’s all good. ” Coffee goes right through him”…..my laugh for the day ! Especially since I’m drinking coffee as I scroll your fun and beautiful post! Have to agree… your coffee joke made me giggle… and love that white vase. Art deco, right? Hi Pam, first of all I wanted to say how much I enjoy your posts, they crack me up! Also wanted to tell you I had the same problem this year with squirrels and chipmunks eating my pumpkins and gourds. I live in a suburb of Pittsburgh and never had this problem before. I kept your hot pepper spray recipe but wanted to let you know about another thing I recently found that works. Spray a little Clorox Clean-Up Cleaner + Bleach on your pumpkins and gourds. You can get it in most grocery stores where the cleaning products are and comes in a spray bottle. If you wash the mud off your pumpkins and gourds when you get them, you can then spray them with the Clorox and wipe them off. Don’t rinse, just wipe off. 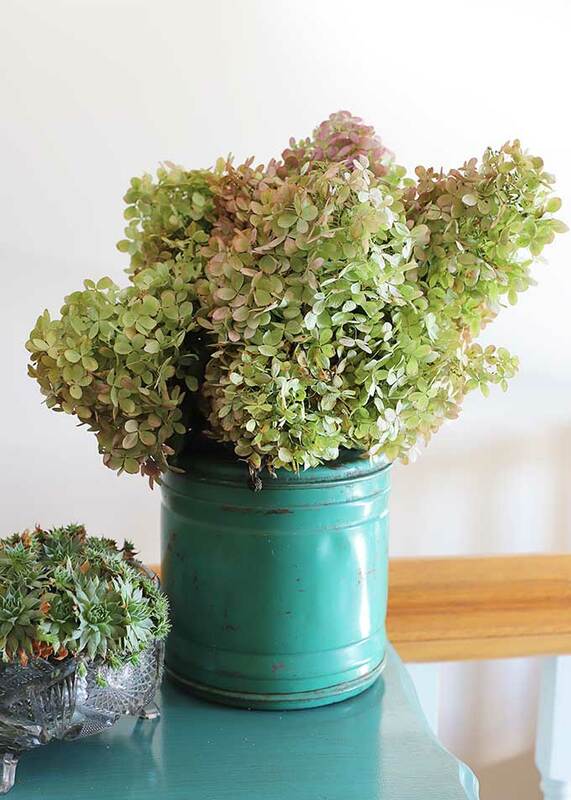 Or you can spray a little right on them when they are outside. I know the hot pepper spray works on my marigolds, so I’m sure it will work as well on pumpkins and gourds, but just wanted to share the Clorox idea too. By the way, Blue Jays LOVE Indian corn too, so watch out for them too, and I don’t think the hot pepper spray bothers them! Beautifully decorated and the touches of Halloween are perfect!